I have a fun Christmas Card over on the Ranger website featuring Perfect Pearls and the Detail Water Brush. Click here to check out the full instructions. Hope you have a creative weekend! 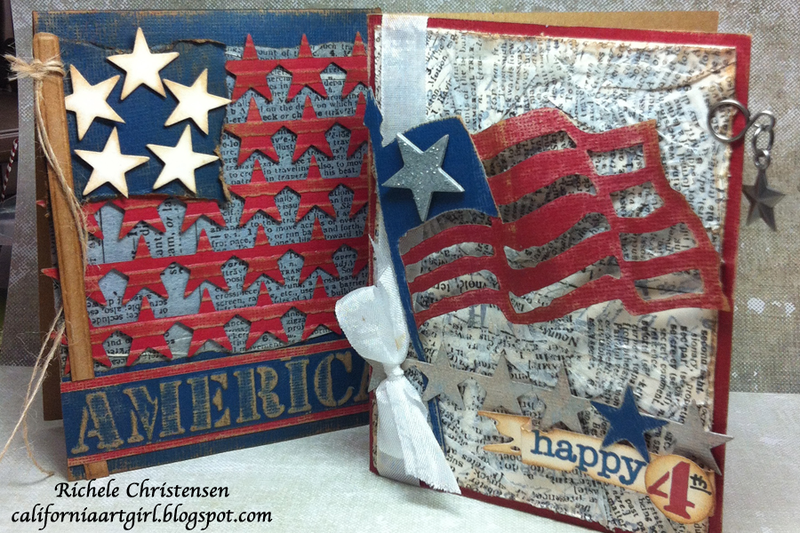 Today I want to share a card I made with the Old Glory Bigz die. Maybe you wouldn't think to use this die for Christmas but I think it's important to get lots of milage from the dies you purchase. 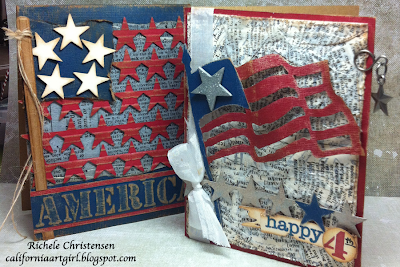 Here are the cards I made earlier this year with the Old Glory Bigz die. You can see my blog post here for the step by step instructions. 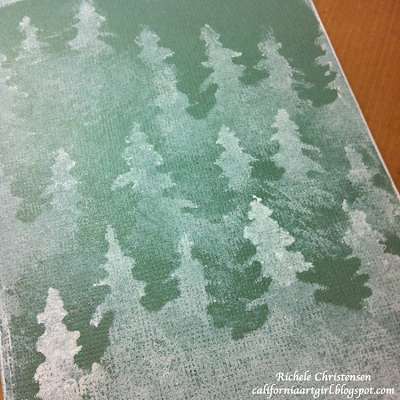 Using the Holiday Words Texture Fade emboss a piece of Manilla card stock that is 4" x 5 1/4". Ink the raised area with Vintage Photo and Festive Berries Distress ink on an Ink Blending Tool. 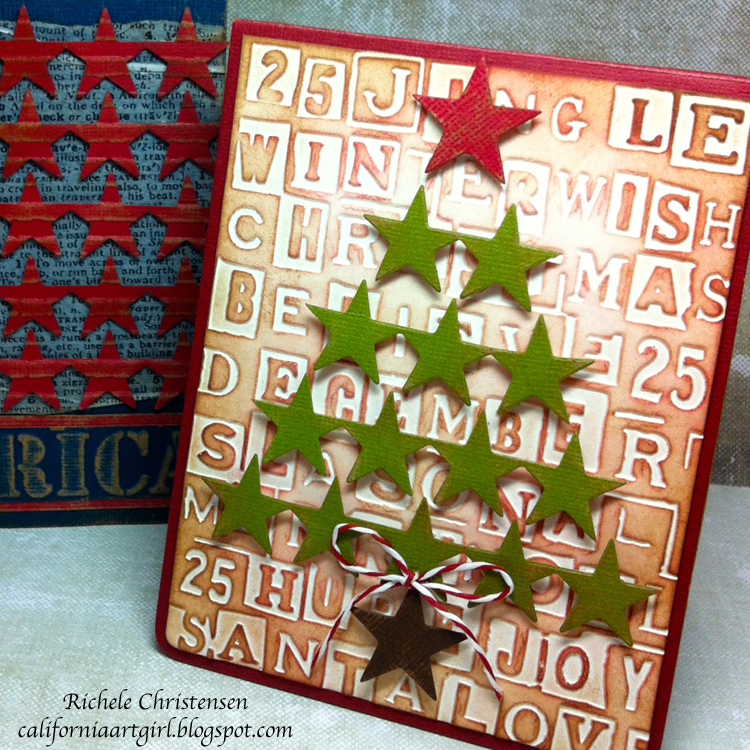 Die cut four rows of stars from green Kraft'Core card stock using the Old Glory Bigz die. 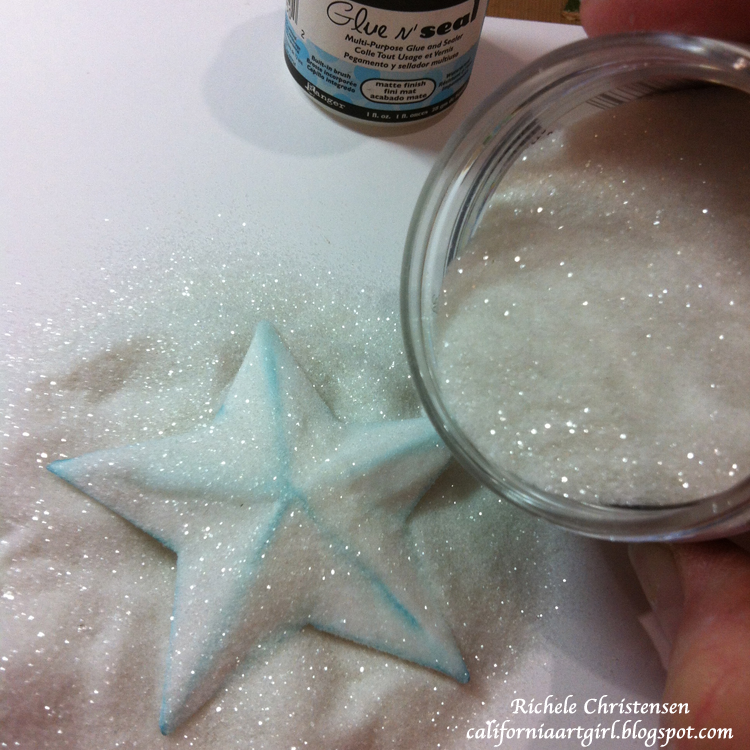 Keep the stars in the strips and carefully sand the rows to distress. 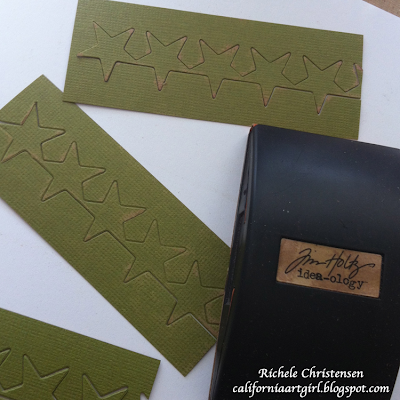 Use the Mini Old Glory Movers and Shapers die to die cut a red and brown Star using Kraft'Core as well. (You could use the Old Glory Bigz die if you don't have both dies) Sand the red and brown star too. Cut the green stars in rows. 5 stars in a row, then 4 stars, 3 stars and finally 2 stars. The red star is for the top of the tree and the brown star is for the trunk of the tree. 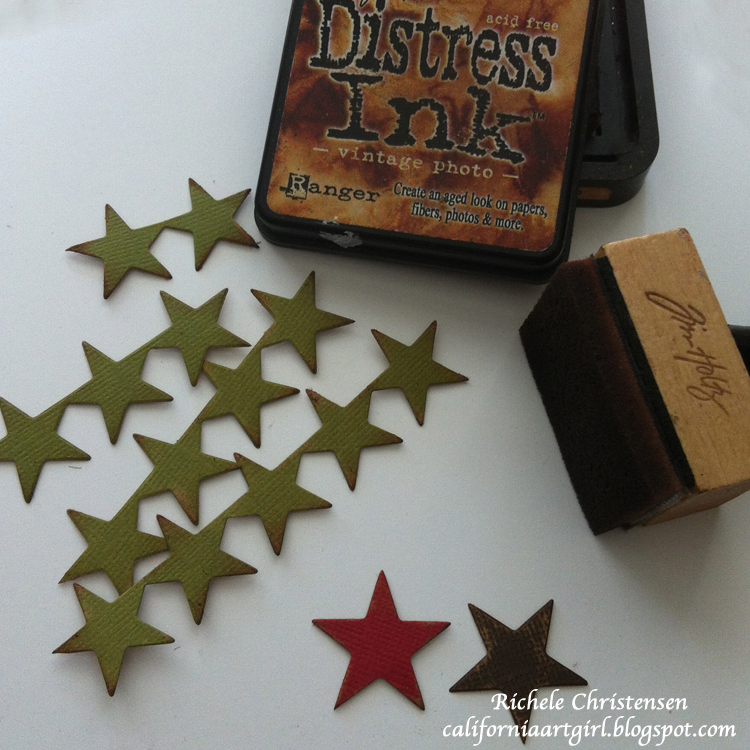 Ink the edges of all the stars using an Ink Blending tool with Vintage Photo Distress Ink. My base card is the darker red Kraft'Core card stock that has been cut to 4 1/4" x 11" and folded in half. 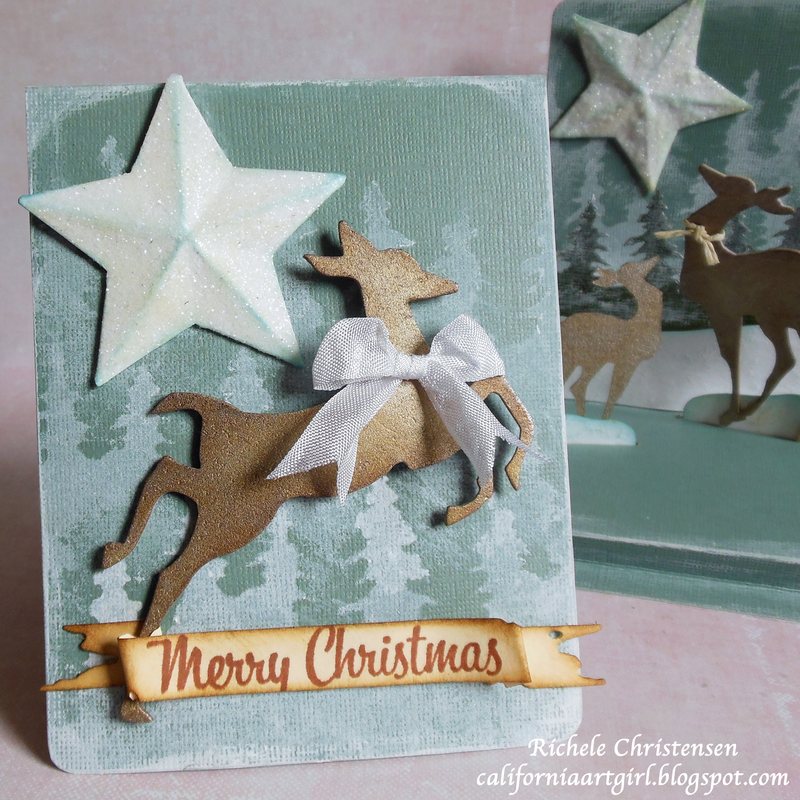 Sand the edges of the card and ink with Vintage Photo Distress ink on an Ink Blending tool. Adhere the embossed background to the card. Start at the bottom and pop dot the brown star to the center of the card. 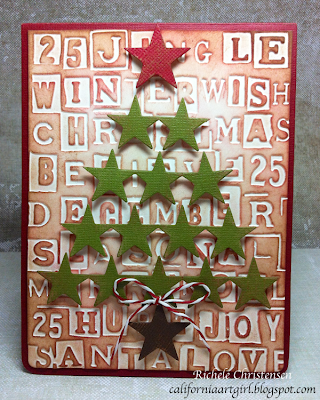 Work your way up pop dotting all the star to the card. For the finishing touch add a little red and white stripe paper Twine bow to the trunk of the tree. See your dies in a new light, think outside the box and multi purpose those dies. This die that has stars and could be used for so many things not just the 4th of July. Think about a card to a Veteran, maybe a baby card, a birthday card. These stars can be so versatile, the sky is the limit! If you need supplies check out Inspiration Emporium for all your needs!! 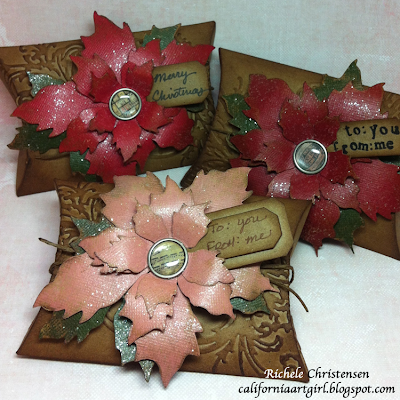 Have you seen Pop 'n Cuts from Karen Burniston? 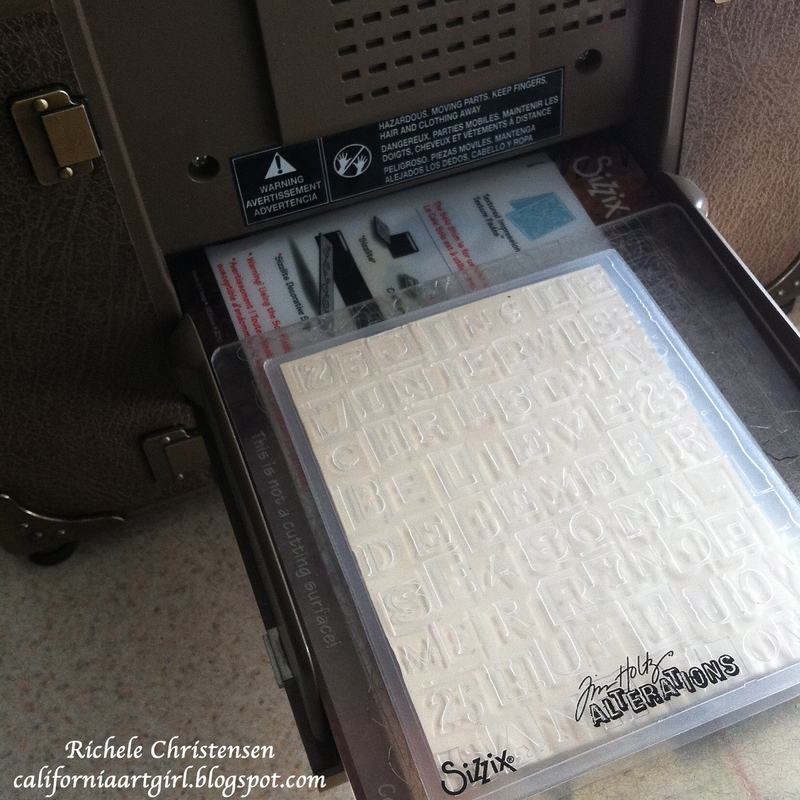 You're in luck, this weekend over on the Sizzix blog we're featuring Pop 'n Cuts! Check it out here! But first take a look below, I know you won't want to miss it! Check out the video here if you haven't seen Pop 'n Cuts, it's awesome! Karen Burniston is an incredible paper engineer! She is so good at what she does and that makes it easy for all of us! Here's a look at the inside! This card has a floating floor! See Karen's video for the floating floor here. 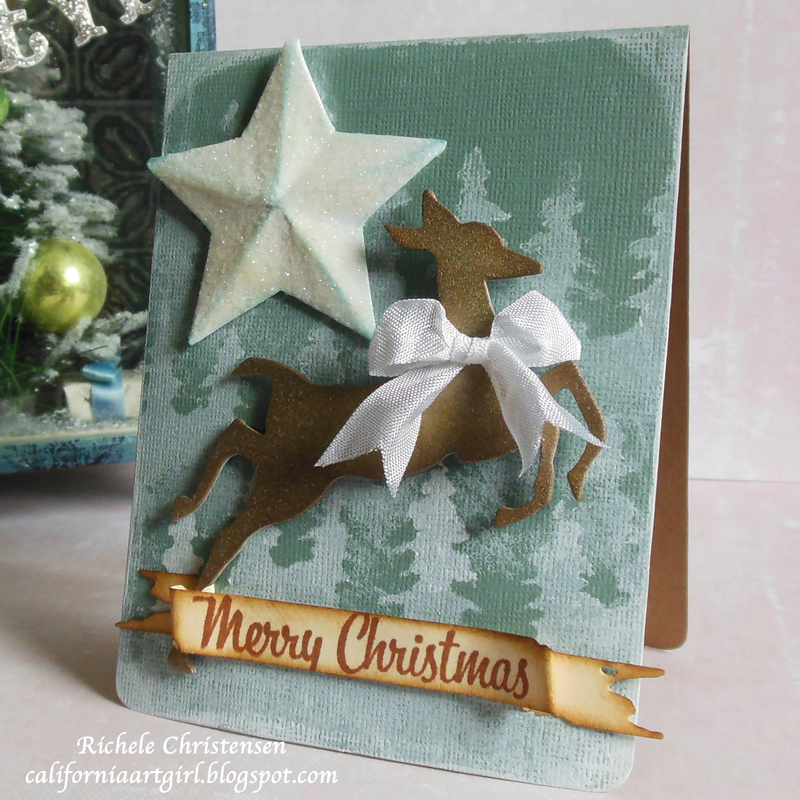 You will need 3 die cuts from the Baisc Pop 'n cuts die using Kraft-Core card stock. #1 the outside of the card, #2 the inside of the card with the insert and #3 for the floating floor. The floating floor will use Karen's template. Score and fold the floating floor as shown on the template. 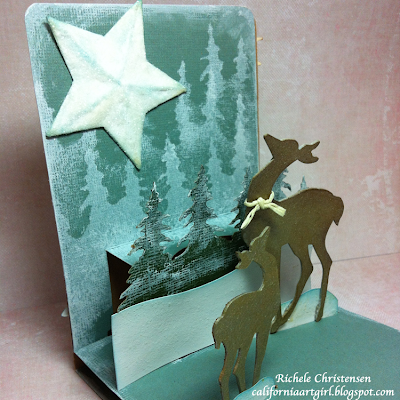 Die cut the On the Edge Die - Tree Line form green Kraft-core card stock. One side will become a template for painting the background. the other will be for the inside of the card. 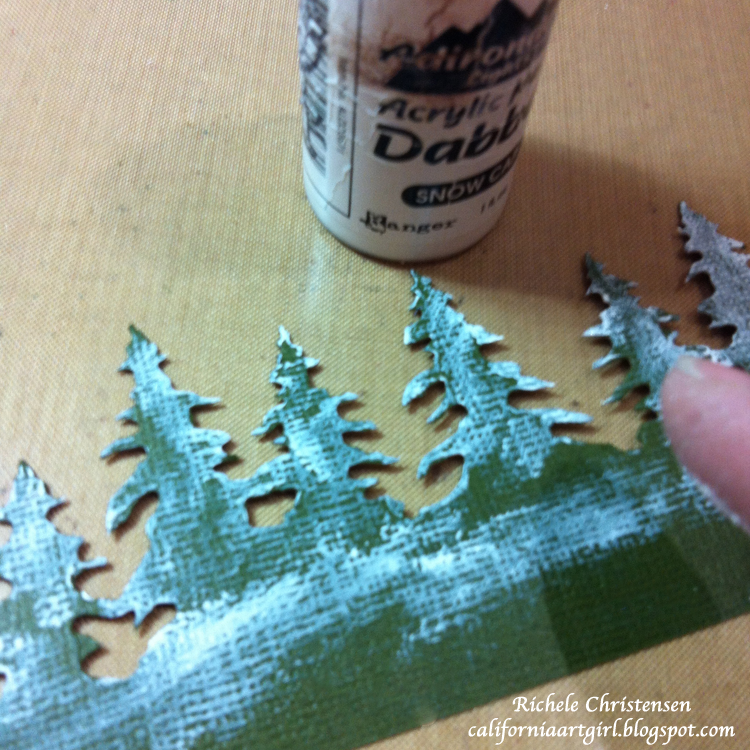 Snow Cap Paint Dabber on a baby wipe paint the tree using the negative space for the template as shown above. Start at the lower portion of the card. Move the template around until you have several rows of trees. Make the trees lighter at the base and darker at the top. Repeat this step for the outside front of the card too. I also edges the card with my favorite brush, my finger using Snow Cap Paint Dabber. Using a brush or your finger apply Snow Cap Paint Dabber AKA snow to the trees. 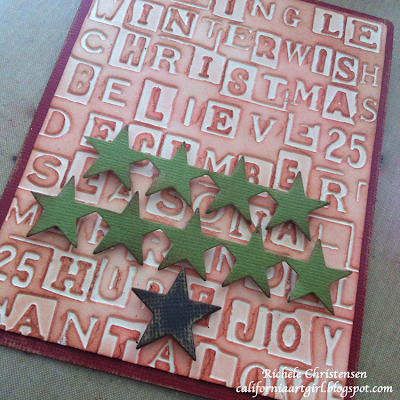 Die cut the Star Bright Alteration die two times with white card stock. This is the smaller a Star. Fold the stars on all the score lines. 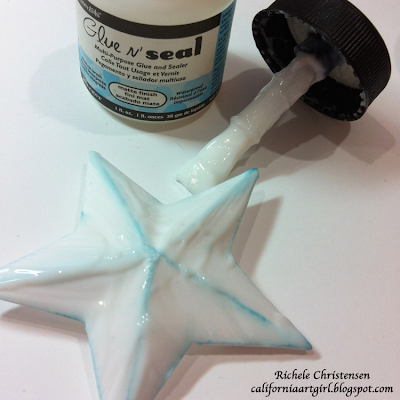 Lightly ink the edges of the stars with Broken China Distress Ink on an Ink Blending tool. Apply a generous coat of Glue n' Seal. 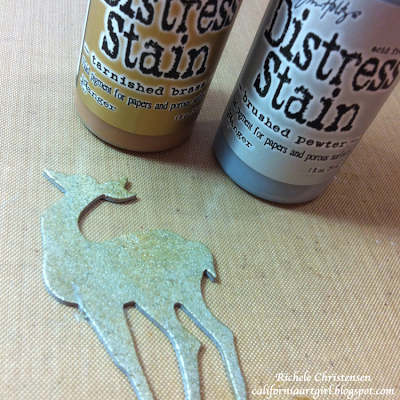 Pour Distress Stickles Dry Glitter to the Stars. Shake off excess and set aside to dry. Die cut the reindeer using both the Reindeer Flight Bigz die and the Movers and Shapers Mini Reindeer die from Grunge Board. Paint the Reindeers using Metallic Distress Stain in Tarnished Brass and then Brushed Silver. You can add a couple coats if you want. Let dry. 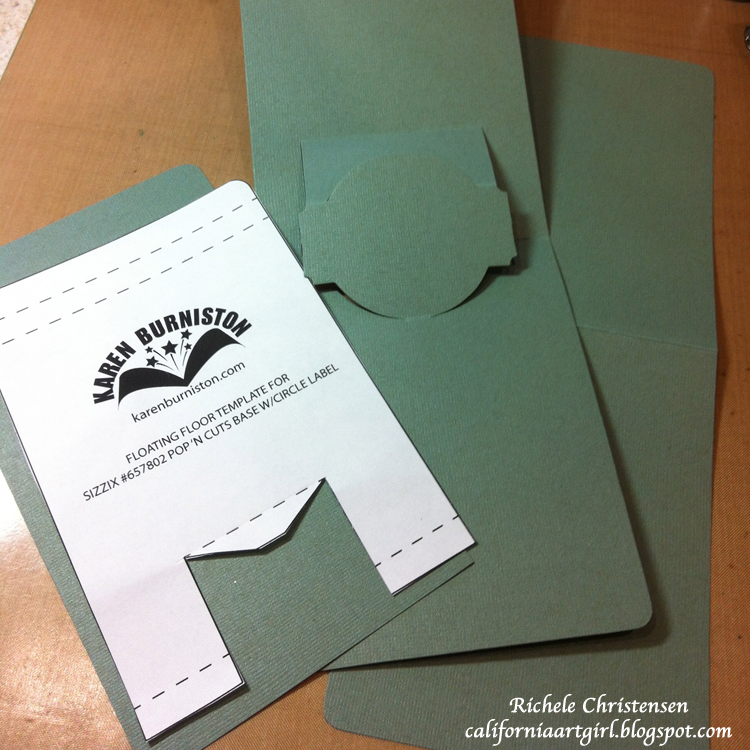 Assemble the inside by cutting the top of the circle on the Pop 'n cuts insert. Attach the die cut trees. 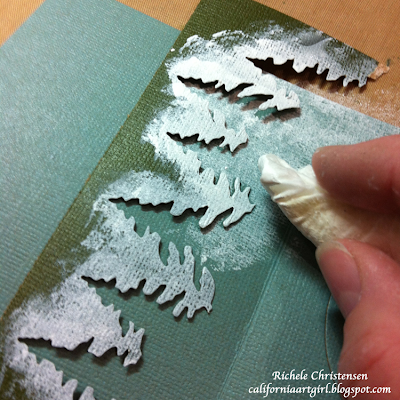 Cut a piece of white card stock for the snowbank and adhere to the die cut trees. For the reindeer refer to Karen's video on inserting a floating floor. It's easy! Create little snow banks for the deer to adhere to. I inked the edges of all the snow banks with Broken China Distress Ink on an Ink Blending Tool. Adhere the Star with Glossy Accents the die has little tabs for gluing, genius! Adhere all the elements to the front of the card too! 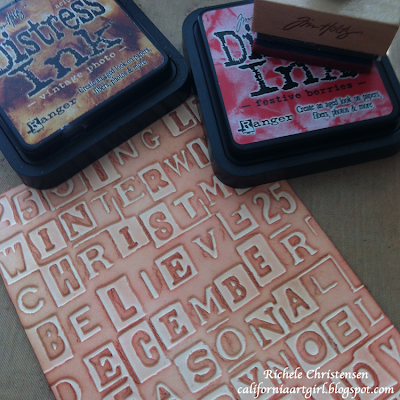 Add the Distress banner at the bottom with Merry Christmas stamped in Sepia Archival Ink. Ink the edges of the banner with Vintage Photo Distress Ink on an Ink Blending tool. 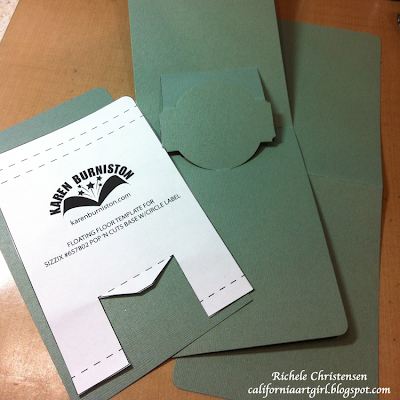 Assemble the inside card to the outside card with paper adhesive. I hope you will try the Pop 'n Cuts soon it's lots of fun and the results are AMAZING!! The possibilities are endless. 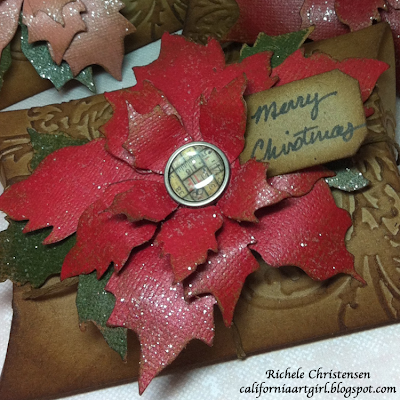 Don't forget to take a look at the Sizzix blog for more inspiration. Thanks so much for taking the time to stop by. I would love to hear form you, so please leave me a comment. I'm sharing this project over on the Sizzix blog today featuring new dies from the Tim Holtz Alterations line.